On my list at school yesterday was to clean my room. I got distracted a lot, so I didn’t finish all the room cleaning I wanted to, but it’s looking ok.
One of the things that distracted me was doing a water change on the aquarium in my room. Besides changing the water, I also cleaned out some of the older floating plants. They were decomposing and clouding the water. 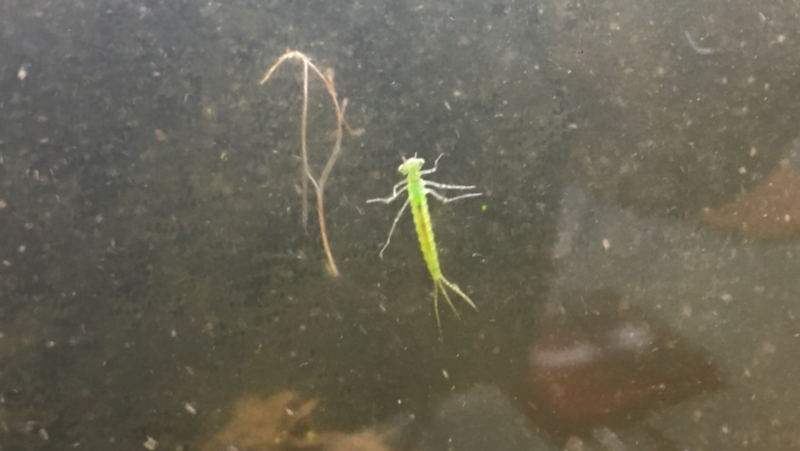 When I moved one of the clumps of floating plants, a weird thing came swimming out of it. At first I thought my guppies had reproduced. As I got a better look at the thing, I realized it was some kind of insect. It must’ve hitchhiked in on the plants. I don’t know what it is, but it looks kind of like a damselfly. The internet says damselfly nymphs are bad. They sometimes eat small fish. Maybe I’ll try to catch it. What! A bug in your water? Tell that thing it’s buggin’ wrong. Indeed, that looks like a damsel fly nymph alrightee…happy hunting there. On a totally-unrelated note: Thursday’s final workshop at my new school ended by introducing the summer reading book (Teach Like a Pirate) with the sound track from Pirates of the Caribbean. You have to know I immediately went (in my mind) to that “Sound Track of Your Life” chapel you did at BLS/CPS years ago. Good memory. Know that you are never far from mind, Brad.